It is expected that HTC will release the Google Play edition of their 2014 flagship, HTC One M8. But it’s quite unexpected and nice that they’ve decided to release both a Developer edition and Google Play edition at the same time of original Sense powered HTC one M8. The HTC One M8 Google Play edition has stock Android 4.4.2 KitKat inside. The device is priced $699, which is strange since the bootloader should be unlocked and flashing a GPE ROM should be easy. Developers who need unrestricted access to the phone will also enjoy the $649 Developer edition, same price as the consumer device. *Update: HTC One M8 Googple Play Edition is now just $499 at US Google Play Store. Keep in mind that these two devices have exact same hardware like the mainstream HTC one M8, there only difference is their Software. 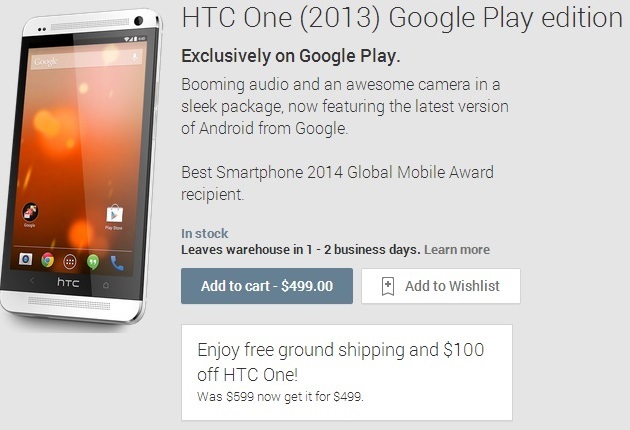 The Google Play Edition is already available for pre-order from the US Google Play Store. There's no update when and where the Developer edition will be available.